Analyze the value of your goods through market research to set accurate prices. While visiting a foreign country a few years back I remember shopping around and seeing something I'd wanted to purchase. The only problem was that, even if I were to ask how much the product cost, I still wouldn't have known what the price was. Because quite simply - I didn't speak the language. Sometimes when you have this fabulous product or service, knowing how to price it can seem a little foreign. 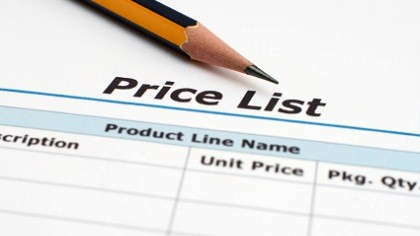 I always recommend that if you're trying to price a service or product that is very similar to others on the market, find out what the other businesses are charging. To find out this information, just pose as an interested customer. That's another reason I love the Internet. Finding out what a competitor charges has never been easier. Many times you can find their pricing information right on their website. I'll have to admit, the whole pricing thing can get so confusing. Let's say you made this beautiful widget. Everyone that sees it is in total and complete awe. When people ask the cost of what you are selling, you tell them the price, and they get this stunned look on their face and say, "That's it?" Now you know it didn't take you all that long to make and the materials you use are practically free. What do you do in this situation? Well, if I were you, I'd raise your price until people stopped saying, "That's it?" Now, let's say you make this painstakingly time-consuming craft. The materials can only be bought from a small tribe in Africa. So of course, you have to charge BIG money. Only problem is - no one buys, because who in their right mind would pay that type of money for such a simple looking product? One crafter, Beth Fisher, shares the formula she uses for pricing her handcrafted items. Cost of materials (at what I pay for them wholesale) + time (at minimum wage) = cost of item. Beth explains, "I've found that this is the fairest way to price my items, both for me and for my customers. People in our area expect you to just take the cost of materials, and double it for the retail price, but since I hand-crochet and bead most of my items, the only way to get paid for my time is the above method. Haley Peter has a quilt repairing and finishing business called " A Stitch In Time". For many years it was just a hobby, until recently when she decided to turn it into a business. Haley explains, "I came across the problem of pricing my services. So what I finally did was to make up survey forms. I asked my customers, other quilters, friends, family and anyone else I could find that would take a few minutes to answer my questioner." She basically asked them what they thought was a fair prices for each quilting service. After Haley got all of the surveys back she added up each service and divided the total by the number of surveys (averaging) and she had her prices! Missi White is the owner of "Secretary to go....you only call when you need me!" It's an "off-site secretarial service providing for your on-site needs." Missi started this business because, after working 12 years as a secretary, she left to become a stay-at-home mom. However, she still had employers asking her to do various projects because they knew she did such wonderful work. The pricing dilemma hit Missi as well. "I was still apprehensive about charging 'too much' for such services. One particular client of mine is a small architectural firm that operates as a non-profit ministry to churches and seminaries. I never wanted to charge much more than the employer had paid me as an employee." Missi's extremely supportive husband urged her to charge almost $5 more per hour than she had been paid by the firm. Missi says, "I felt guilty and approached the issue very gingerly. They were in a desperate situation and gladly paid "whatever you need to charge!" I remained the sole secretary for that firm working with an off-site arrangement for nearly 9 months! Missi had another former employer call her in desperate need of her skills. Since she would have to go into his office and work around her carpool schedule and obtain babysitting for her preschooler, her husband once again advised her to make sure she accounted for babysitting costs and add those as well. "Again, I felt apprehensive," says Missi. "I gingerly told him my fee (which was double what he had paid me when I was on his payroll) and he said "fine....whatever you need to charge. I need help and I wanted YOU." I think Missi sums up nicely the feelings you get when deciding what to charge. "So......while I know that I am a fabulous secretary because I adhere to the rules of the old school.....loyalty, hard work, thinking ahead of the game.....I sometimes think I am being presumptuous and taking advantage of a desperate situation to charge the fees that I do. I have learned I am very low priced for the market in my area. I am learning that when someone SEEKS ME OUT, they really want ME!!! And I do not have to work for them, so I can charge to make it worth my time. The next time I get a request for STG's services, I will be re-printing my fliers and raising my rates. You get what you pay for, and I know I can give the quality work I am charging for!" Many times as work-at-home moms we tend to undercharge. Guilt is a big factor when deciding what to price. However, if you know in your heart you are providing the type of service or product that can't be found on every street corner and you are being pursued because of your skills, don't forget to add all of your costs into your rates. You'll feel so much better about yourself and you'll make more money.